Customization is key. Here's how to build a meal at the Mexican chain that is healthy and satisfying. Sure, Chipotle offers food with integrity, but we’ve been down this road before when talking about clean labels at other chains, like Panera Bread. I’m all for food sourced from better ingredients, like poultry raised without antibiotics and food made without artificial additives, but while these sourcing practices are great, they don’t always indicate the healthfulness of every menu item. Case in point: A burrito from Chipotle starts with a white flour tortilla, and may go further downhill with the addition of white rice. A few fillings later, including queso, cheese and sour cream, and you’ll wind up with a meal that clocks in at more than 1600 calories — the amount that meets the daily calorie requirements for many women. Even when considering that 2,000 calories is the amount that food labels list to standardize the daily values, this exceeds 80 percent of the daily needs for most people. Plus, all of those overly refined grains aren’t doing you any favors. A burrito with all the fixings can clock in at more than 1600 calories — meeting the daily requirements for many women in one meal. It’s easy to see how you can quickly take a wrong turn at Chipotle. But just as easily, you can create a variety of light, healthy, filling and incredibly delicious meals. As with many restaurant meals, customization is key! Here are some customization tips followed by some satisfying meal ideas. I hate to be the one to break the news, but it’s possible to get too much of a good thing. I frequently spot these healthy food portion problems among my clients, and the fact is, even healthy fare, including nuts, avocados (and avo-based foods, like guac) can be eaten in excess of our needs, which could be why your clothes aren’t fitting well. Get the guac on the side and use about half the amount they dish up. Quality carbs, including brown rice, black and pinto beans, and corn salsa, are easy to come by at Chipotle, but adding each of them to your bowl could put you on the other side of light. Don’t get weighed down with starchy carbs. Instead, choose a half portion of brown rice, or skip it in favor of extra veggies. Between the crunchy romaine, the flavorful fajita blend, and the zippy fresh tomato salsa, you can take any meal to the next level of healthy by doubling up on veggie portions. Black beans and pinto beans are a prime source of fiber — between 7 and 8 grams, depending on which you choose. While we need 25 to 38 grams of this nutrient, most Americans get just 16 grams. Beyond fiber, beans have some pretty great perks. One recent study found that adding ½ to ¾ cup of pulses, which includes beans in addition to peas, lentils, and chickpeas, can prompt weight loss, even without other behavior changes (like killer workouts!). Because they’re a rich source of nutrients, eating beans can improve your overall diet quality, and they’ve also been shown to reduce your risk of diabetes and protect you from heart disease. At Chipotle, the beans are vegan, making them a great protein choice for people who don’t eat meat. One recent study found that adding ½ to ¾ cup of pulses can prompt weight loss, even without other behavior changes. You know when you ask for a little cheese and the server goes in for a fistful? There’s nothing wrong with a little cheese, but there is a difference between a little and a lot. For most people, a big pinch is probably going to be a better portion than a fist. The giant soft flour tortilla that keeps the burrito fillings contained has four times a standard serving of processed grains. That means excessive amounts of calories and carbs. Beyond the obvious issues, the calories from processed foods like this burrito aren’t handled the same way in your body as whole foods. One four-year study found that eating refined grains and sweets was linked to small, but measurable weight gain, while eating more whole foods was linked to weight loss. Another study looking at two cheese sandwiches containing equal calories found that the women who consumed the whole foods version made with whole grain bread burned 50 percent more calories after the meal compared to those fed the white bread version. 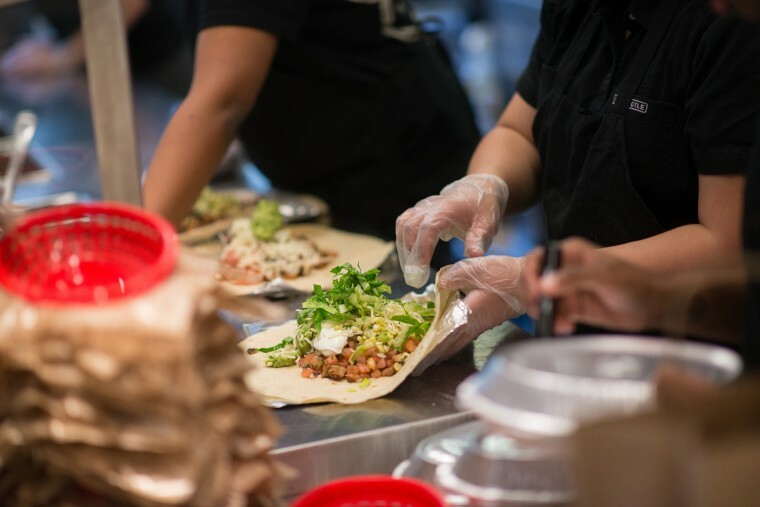 The bottom line: You’re better off leaving the processed, bread-y burrito behind. Now that you know how to customize a healthy order at Chipotle, here’s how that translates to your plate. Burrito bowl: A half portion of brown rice, double romaine and fajita veggies, a portion of black beans, a protein (let’s say steak, which pairs perfectly with the other ingredients suggested here), a scoop of fresh tomato salsa, and a half serving of guac. This meal gets creaminess from the guac so you can skip the cheese in this instance. All told, you’ll get 15 grams of fiber and 36 grams of protein to curb hunger for hours. For similar nutrition stats, you could swap out the half portion of brown rice for a scoop of the corn salsa since corn is considered a whole grain. Salad bowl: Keep things even lighter by ordering a salad bowl. The romaine base, along with your choice of protein (such as chicken), black beans, flavorful fajita veggies, fresh tomato salsa, and a pinch of cheese provides 10 grams of fiber and 48 grams of protein, plus about 1/3 of your daily calcium and iron needs. Since the salsa and the fajita veggies are packed with flavor, you can skip the dressing or order it on the side to drizzle on as needed. If you’d like, add the corn salsa, which brings more whole grain fiber, and top with a dollop of guac. While it’s easy to build fresh-tasting and nutritious meals at Chipotle, one thing to keep in mind is that even when carefully chosen, these meals are high in sodium, clocking in at about half of the upper amount you should eat in a day. This is notorious among restaurant fare so your best bet is to limit the meals you eat out, and when you do dine out, make sure to flush all that extra salt with plenty of water and fresh produce throughout the day. Fresh fruits and veggies provide potassium, which offsets some of the impact of sodium on blood pressure.